This electric transport device has an ergonomic handle. It can pull very heavy loads without causing any stress to arms, shoulders or wrists. Its great manoeuvrability allows you to move in confined spaces and it can be attached to almost any cart. The flexible steering function ensures ease of use. The ergonomic handle pivots in all directions, left, right, up and down and comfortably fits the users hand. The user easily controls the speed. During transport there is minimal stress to shoulders, arms or wrists. A light lever is used to control the driving direction. Can be used all day without recharging. A powerful electric motor enables the Functional Mover to transport large capacities. 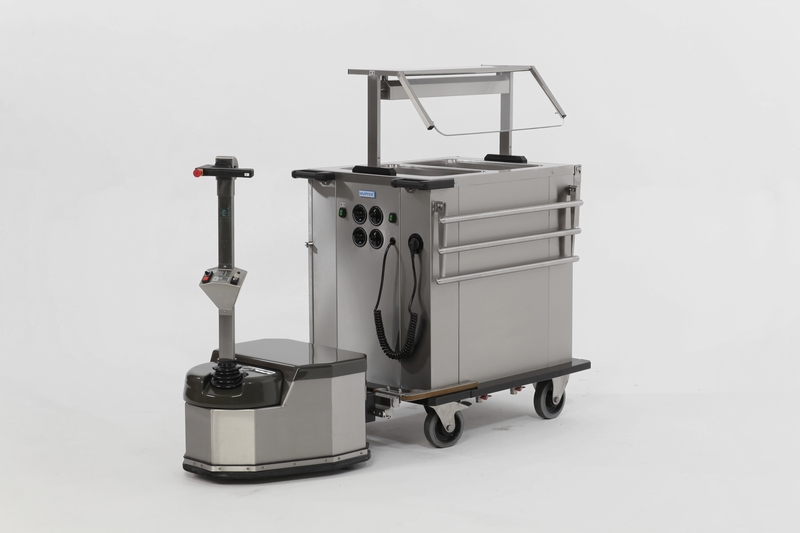 The Functional Mover is very reliable and almost maintenance free. All control functions are on the handle. The Functional Mover turns easily on its own axis. The Functional Mover has dry batteries, a built in charger and low voltage protection. Several coupling systems are available or can be custom made thereby ensuring the possibility to transport almost any wheeled container.